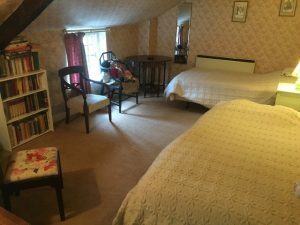 South Petherton, Somerset TA13-The accommodation is situated in South Petherton which is 7 miles from Crewkerne, 11 miles from Yeovil Junction and 18 miles from Taunton. A bright but lonely older person is seeking a Sharer for their home to give them some friendly company and around 15 hours a week of practical help and companionship in exchange for the low cost accommodation. This person would really benefit from the reassurance of having someone around the home to give company in the early evenings, and the reassurance of someone sleeping in the property over-night. The accommodation on offer is a good sized bedroom in a pretty country house with a garden. The room currently has two single beds but could be reconfigured to suit the right Sharer. There is a shared bathroom with a separate shower. The kitchen has a washing machine, an old range and a modern cooker and a microwave. There is no dishwasher. There is parking available. The accommodation is situated in South Petherton which is 7 miles from Crewkerne, 11 miles from Yeovil Junction and 18 miles from Taunton. This older person would appreciate some practical help around the house – which could include light cleaning and tidying, some shopping, cooking, taking out bins and changing lightbulbs, for example – but mostly is looking forward to the companionship of having someone living with them, helping to read to them, chatting, watching the news, dramas or documentaries with them. We hope to find a bright and kind Sharer who will enjoy this opportunity. The ideal Sharer will be a friendly and interesting non-smoker who speaks clear fluent English and who will be a positive, helpful and supportive companion. If you are interested, please email a little information about yourself, your hours of availability, if you can commit for at least a year, and why you are interested and think you may be suited to this share. We can then give you more details about this specific situation. Please note NO ANIMALS allowed. We charge a monthly fee of £125 plus VAT [total £150] for doing this. No rent is payable on top of this, although you may be asked to make a monthly contribution of up to £25 towards bills/council tax [students are exempt from council tax].